CHICAGO HEIGHTS—(ENEWSPF)—March 26, 2017. Union Street Gallery will be bringing some Kentucky Charm to the south suburbs at its annual Derby Day event on Saturday, May 6. 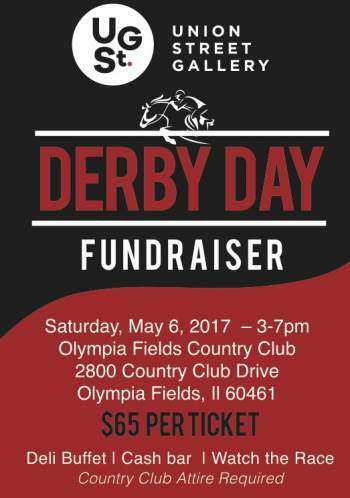 The event will be held at the Olympia Fields Country Club, 2800 Country Club Drive. Enjoy the pageantry and good company associated with the Derby. We have hats, food, drinks, good company, and of course the race. Olympia Fields Country Club is a beautiful place to spend the day with Union Street Gallery. This is one of our two main fundraisers for the year. Purchase your ticket today to support our continued efforts to bring a variety of high quality art exhibitions and art programming to the south suburbs. Tickets are $65 per person and include a bird’s eye view of the race and deli buffet. There will also be a cash bar. A variety of artists associated with Union Street Gallery donate some fabulous hats for us to sell at the Derby Day fundraiser. Pick out your favorite one of a kind Derby hat to wear during the event. Hats start around $40. Which Horse will win? Which raffle Prize will you win? There’s lots of ways to win at Derby Day. Guests are invited to bet on the winning horse. Additional information on the raffle prizes that will be available during the event will be posted here. If you are interested in donating a raffle prize, contact us at [email protected]. Country club attire is required at the event. You can learn more, including information on sponsorship of the event, and purchase your tickets online, or by stopping in the Gallery located at 1527 Otto Boulevard in Chicago Heights.